In many cases, flying out for a family vacation typically means leaving your pets at home. However, United Airlines makes it possible to take your pet along for the ride. United Airlines pet policy provides accommodations for pets whether they’re allowed to sit in the cabin with their owner or transported separately. Only specific small animals are allowed on United and United Express flights. United airlines pet shipping includes rabbits, dogs, household birds, and cats. These animals are allowed to travel in the cabin on all flights within the continental United States (not including Hawaii). There are a number of restrictions concerning routes as well. For instance, only service animals can travel in the cabin if the flight is headed towards the United Kingdom. Furthermore, all pets are banned from traveling in the cabin for all flights bound for Guam, Hawaii, Austria and all other countries that require pets to gain entry as manifest cargo. Nigeria, Lagos, and Dubai don’t provide any services at all. On aircraft classified as Boeing 747, 757, 767, and 777, pets are banned from business and first class because of lack of space underneath the seat. 17.5 inches x 12 inches x 7.5 inches high (44 cm x 30 cm x 19 cm). When it comes to soft-sided kennels the maximum dimensions are 18 inches long x 11 inches wide x 11 inches high (46 cm x 28 cm x 28 cm). United Airline pet fees are $125 USD. You can pay when you go to check in at the reservations counter. Keep in mind that you will have to pay $125 in additional fees on all flights that experience layovers longer than 4 hours in the US or more than 24 hours outside of the United States. Let’s say that you don’t have a pet that meets the requirements to travel in the aircraft cabin. Thankfully, United Airlines PetSafe program, a program designed specifically for animals that can’t travel in the cabin, has been implemented to help those who have larger animals. First, know that United Airlines PetSafe reviews are largely positive. The service is excellent and customers love it. You will have access to United Airways PetSafe tracking, where you’ll be able to track your pet at all times. Another benefit is that you can earn 500 MileagePlus award miles for each shipment made by PetSafe within the United States. This includes 1,000 miles for all other types of shipments. 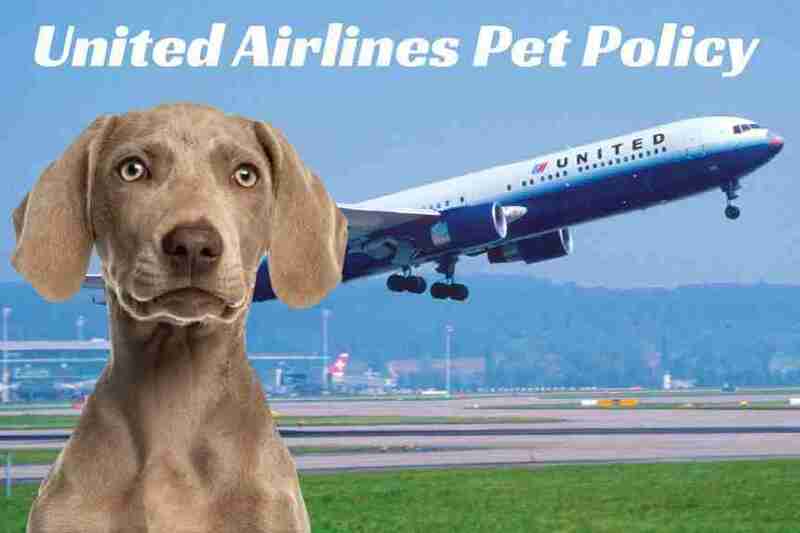 The United Airlines PetSafe phone number is 1-832-235-1541. Guinea pigs, rabbits, dogs, cats, hamsters, and household birds. Between May 15th and September 15th all Boston Terriers, American Bulldogs, and any mixes of these breeds will be banned from United Airlines pet transport. Furthermore, between September 16 and May 1 animals can only travel on routes where the temperature won’t exceed 85 degrees Fahrenheit. United restricts services to Nigeria, Lagos, and Dubai. Also, pets traveling to Australia can only enter at Melbourne. One of the primary forms that you need is a health certificate that has been endorsed by either the USDA or the CFIA when traveling from either the United States or Canada (must be issued within 10 days of travel). Furthermore, you’ll also need all essential documents from the country of destination as well as proof that your pet has been vaccinated for rabies within 30 days before travel. All pets that travel within the cabin must be transported in either a hard or soft sided kennel that has been approved by United. If these requirements aren’t met only one pet will be allowed to travel per carrier. Be mindful that United Airlines will not transport kennels from the 700 series on their 737 700/800 and 900 aircraft. Make sure that you pay extra attention to United Airlines pet cargo regulations to avoid issues before traveling. The United Airlines pet cargo phone number is 1-800-575-3335. The costs can vary from animal to animal. The cost is ultimately contingent on the combined weight of the animal plus the weight of the kennel. Those who qualify for emotional support animals as well as providing the proper documentation such as an ESA letter and the UA form, will be allowed to bring their pet into the cabin. Those animals traveling to an international destination may require additional documentation. Keep in mind that certain countries don’t allow the entry of animals, so do your homework before making plans to travel with your pet outside of the country. In fact, it would be best to contact the appropriate embassy or consulate to ensure that you’re following all of the right procedures. Regarding proper United Airlines in-cabin pet policies, your emotional support animal should be able to sit under the seat of their owner without protruding out into the aisle. In-cabin kennels are allowed for smaller animals, but that is left up to the discretion of the owner. The seating in the exit row is restricted to pets. Keep in mind that prior to the time of travel, the accessibility desk must both obtain and authenticate the proper documentation. United’s verification process may include getting into contact with your mental health professional to verify that you do indeed need an emotional support animal. If the verification process fails regarding the documentation not being approved or if an individual fails to give proper advance notice, all emotional support animals will be viewed and transported as normal pets, and all pet fees will apply accordingly.